Olivia Rabbitt, IGI’s program coordinator, harvests lettuce. By the time the first snowfall blankets the Island, the growing season has been put to rest. Fields once overflowing with colorful produce lay dormant. Roadside farm stands sit bleak and bare. And farmers bone-tired from working their land all summer long finally take a much-needed break. The West Tisbury Farmers’ Market continues in a pared down way inside the Agricultural Hall, but for the most part Islanders who are used to driving to their favorite farm stand for fresh homegrown fruits and vegetables are relegated to foraging in the produce section of the grocery store, combing through selections grown far away. For the roughly forty families who can sign up for Island Grown Initiative’s (IGI) Community Supported Agriculture (CSA) program, however, their weekly trips to a farm stand continue throughout the winter as they travel down a bumpy dirt road near the center of the Island to a greenhouse humming with life. There, they pick up their weekly allotment of mixed greens, herbs, and, if they’re lucky, a fresh pint of strawberries. Thanks to the acre-sized hydroponic greenhouse at IGI, the nonprofit dedicated to providing equitable access to local food on Martha’s Vineyard, the winter months are just as important as summer. In addition to the CSA, crops grown during the colder season are sold to the schools at deeply discounted prices, and, in partnership with the Vineyard Food Equity Network, were distributed at Woodside Village in Oak Bluffs last year. 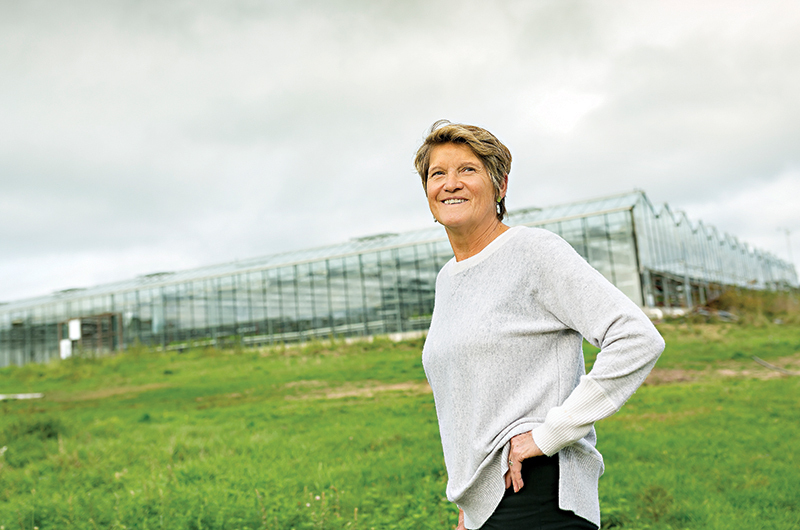 IGI’s Farm Hub, located on forty acres of land formerly known as Thimble Farm in Vineyard Haven, is the home base for the nonprofit’s greenhouse and growing operation. 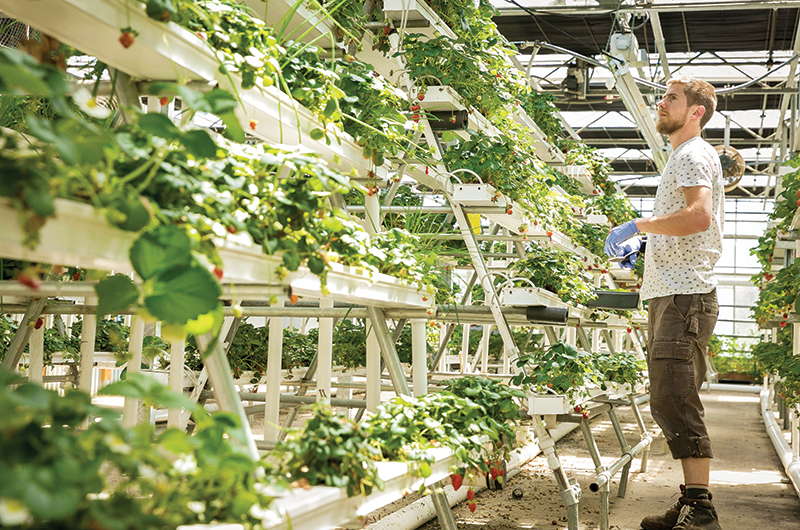 The massive greenhouse was originally designed by a previous owner to grow tomatoes on the hydroponic system, but IGI uses it to produce a wide variety of food crops and fish. 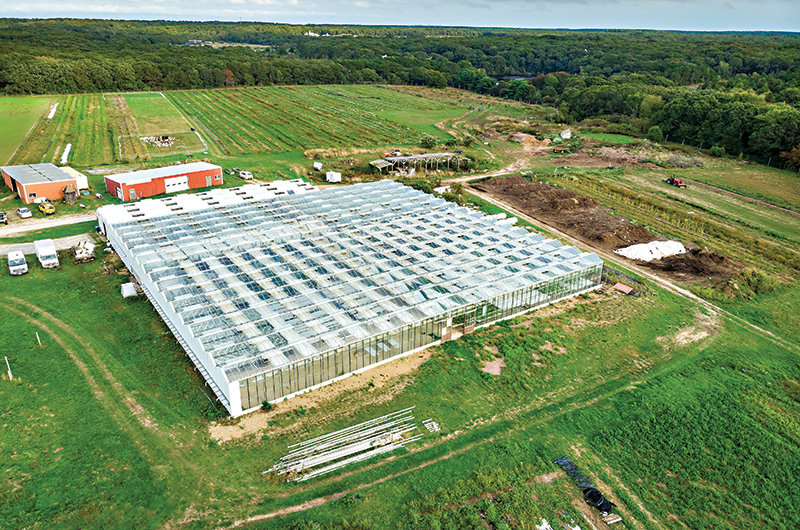 The Farm Hub’s greenhouse dominates one acre of land on the forty-acre property. 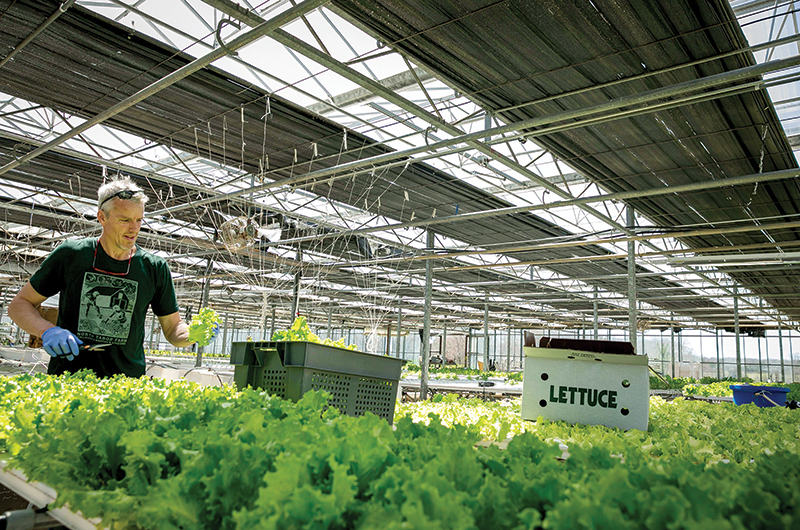 During the peak seasons of spring and fall, more than 4,000 hydroponic plants are in the system. Tomatoes, arugula, mushrooms, and more are harvested for the nonprofit’s free community lunch program, which served 3,000 meals this past summer at the Martha’s Vineyard Family Center in Vineyard Haven and the Oak Bluffs and West Tisbury libraries. Additional produce is sold at low prices from its Mobile Market, a revamped 2005 Chevrolet Cutaway G3500 van that goes to six locations five days a week. But in the winter, greenhouse manager Taz Armstrong and his right-hand man Alex Parris close off the north section of the greenhouse and focus solely on growing cold weather crops. One section is dedicated to cascading strawberry plants with ripe red berries. Another features tiny heads of lettuce. “They don’t need any additional heat besides what they get from solar gain, so they can take a much colder climate,” Armstrong said. “The really neat thing about hydroponics is you hear water running all the time,” added Farm Hub director Matthew Dix. Hydroponics is a method of growing plants in a water-based, nutrient-rich solution, meaning they never actually see soil. Instead, peat, which is a soil replacement, is used to support the plant in the system it sits in, allowing it to constantly be in contact with the nutrients that flow through the water below. “You think it’s high water consumption; it’s actually the opposite. It’s water being recycled endlessly,” said Dix. The water comes from four tanks that are home to around 1,300 rainbow trout. Armstrong, who has been with IGI since 2010, explains the aquaculture side of the operation: “Water from the fish [tanks] gets pulled out and goes into a gray water system, which is basically something to separate the solids,” he said. Once separated, the clean water flows back into the fish tanks while an additional pump takes out the wastewater to be used as a supplement to the plants in the hydroponic system. The marrying of the two systems is called aquaponics. Even in the dead of winter, when temperatures drop to single digits, inside the greenhouse there is constantly something to be done. “We’re growing all the time,” said Armstrong. “We typically harvest in the morning...package on the same day as harvest.” Each day focuses on a specific produce, like salad mix on Wednesdays or pea shoots and micro greens on Thursdays. Deliveries to Cronig’s Markets and restaurants are another day, while the CSA pickup runs Thursday through Sunday. Greenhouse manager Taz Armstrong checks on the strawberries. What members get are hydroponically grown varieties of greens, such as the salad mix, micro greens, cooking greens, or pea shoots, plus strawberries and cucumbers. “We grow five predominant green varieties, and then we also add in, like, fifteen other smaller things,” said Armstrong. Storage crops from local farms occasionally are added to the mix as well as rainbow trout. “You can’t eat greens forever,” he said. IGI’s focus on wintertime growing is not entirely by accident. Five years ago, in the spring of 2012, donors gave the $2.6 million Thimble Farm property to IGI to ensure the continued preservation of agricultural production on the land. The farm had deep roots in Island soil. For close to 300 years it is believed to have served as a dairy farm for Elisha Smith and numerous family members before him. Then, in 1981, it became a pick-your-own berry operation run by Bud and Patricia Moscow, who built the greenhouse with a plan to raise hothouse tomatoes. Most recently the farm was the home of Andrew Woodruff’s Whippoorwill Farm CSA. No one wanted to see it broken up and turned into housing lots. But initially, the decision to gift the land to a nonprofit wasn’t universally praised. On an Island that already has close to forty other farms trying to turn a profit on what they produce, having a nonprofit step onto their turf caused some problems. There was pushback by some Island farmers who feared that if IGI used the greenhouse as a large-scale growing operation, it would take away from their livelihood. IGI, for its part was, at the time of the gift, a small, homegrown operation. Established in 2005 by a volunteer group, its purpose was to promote Island growers and educate consumers on the importance of buying local. Over the years it had created various programs, including Island Grown Schools, a beekeeping program, and a gleaning operation that harvests excess produce from farms. But up until the point of acquiring Thimble Farm it had largely stayed out of actual farming. Rebecca Haag, IGI’s executive director. Suddenly in possession of a run-down greenhouse and acres of land overworked by years of use, the nonprofit had to grow up quickly. Its first move was to hire Keith Wilda as the Farm Hub’s first director. In his tenure with IGI, Wilda successfully restored the greenhouse and hydroponic and aquaponic systems and was promoted to executive director in 2014. Two years later, in the spring of 2016, Haag, who most recently had been chief executive officer of the AIDS Action Committee of Massachusetts, was named executive director. One of the first things she did was reach out to Island farmers. “Rebecca did a food hub study of the Vineyard where she interviewed most of the farmers and talked about their needs, their wants, their models,” said Dix, who took over Wilda’s spot as Farm Hub director full time a year ago this January. One finding was that most Island farmers rely on their sales of produce and other products during the summer to make most of their farm income, but don’t sell much in the winter. This is the main reason why IGI has decided to do its CSA program only in the winter. Dix, a farmer himself who in his off-work hours owns and operates North Tabor Farm in Chilmark with his wife Rebecca Miller, is also creating channels within the farming community to help expand the five-year-old winter CSA. A partnership with Rusty Gordon, who owns Ghost Island Farm in West Tisbury and does a CSA year-round, could be in the works to bring in a new variety of produce. And Dix has spoken with Vineyard meat growers to see if they would be interested in providing some of their goods. “I would like to branch out more and bring in stuff we don’t have to try and make it more full service,” he said. Matthew Dix, Farm Hub director. Like a plant itself, branching out and experimenting continues to be something of a hallmark of IGI. The Farm Hub hosts workshops all year, ranging from how to grow your own mushrooms, to building your own hydroponic system, to pruning a fruit tree. Tours of the land and greenhouse are open to the public, and schools come in throughout the academic year. A class at the charter school even designed its own hydroponic system with IGI. Outside at the half-acre community garden, a part-time IGI worker helps advise those renting the space to grow their own produce, and extra crops are planted by the nonprofit to help model growing techniques. “Half of our focus here is education,” said Dix. On other fronts, Haag recently helped organize the Venison Donation Program. The collaboration between IGI, the Ag Society, and the M.V. Tick Program, donates meat from deer harvested on the Vineyard to the Island Food Pantry and Serving Hands Food Distribution. And in an effort to rebuild the soil at the old farm, IGI has begun a pilot program of no-till techniques. “One of our farmers [who licensed land] this year is going to try a no-till farming” technique and then report back to IGI, said Haag. No matter, it would seem, the season.